Amid our ever-growing consumption of deft data vizualization, nothing makes for tastier morsels than the fine art of food and dining. 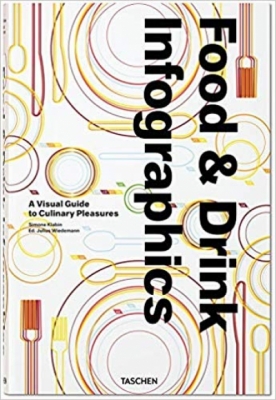 Ushering the cookery book into the future, this volume gathers the best infographics of all things eating, drinking, and cuisine, from conversion charts for measurements to cookie recipes, cocktails, and stress-free party planning. A must-have for every 21st-century foodie, this is gastro-guidance at its most visually appealing as much as expert. Want to master sashimi? Know the secret to perfectly grilled steak? Wow guests with your own dry martini? Food Infographics has all the answers and more, using the best culinary graphics to answer kitchen conundrums in lively, simple, and memorable form. You’ll find infographics on all the food groups, from grains and pulses to fruits and vegetables to fish, meat, and poultry. Recipe inspirations include soups, sandwiches, snacks, sweet treats, and just-right dressings. Other sections cover flavor pairings, baking, beverages, cooking tools and techniques, and coffee and tea. The book opens with a historic survey of food imagery, exploring how and where we have used pictures to enjoy, prepare, and serve food and drink, from Egyptian hieroglyphics for flatbread to 19th-century classics such as Mrs Beeton’s Book of Household Management. Slick, smart, and packed full of perfect nuggets of advice, Food Infographics rounds up a delightful visual exploration of food and dining as much as an indispensable collection of everyday tips, techniques, and deliciousness.